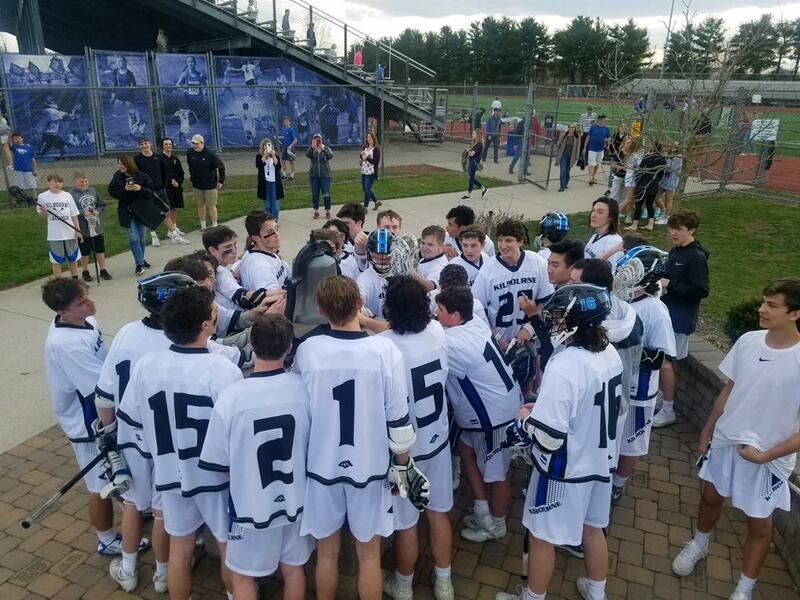 The Kilbourne Wolves staked an impressive victory Saturday night (4/6) in a regional match-up over Mason, 10-7. The Mason Comets traveled to WKHS from Cincinnati. The game was a re-match from last year which the Wolves lost in OT. With that memory still fresh, Kilbourne started this year's contest strong and used sharp passing and good offensive sets to jump out fast. The Wolves scored 5 goals in the opening quarter and took a 5-3 lead. The Wolves extended that to a 7-3 halftime lead and seemed in control. However, Mason was not going to go quietly and put up 3 unanswered goals to start the second half in an offensive blitz . Mason closed the deficit to just one goal after a man-up goal and it was gut check time for the Wolves. Kilbourne answered next with a goal to stem the tide and then extended the lead to 2. Finally, the Wolves added one more insurance goal to ultimately claim a 10-7 win. It was a good game by both teams. Five different Wolves scored in the game and six Wolves registered a point. Kilbourne had a clean clearing game overall as well. Next up for the Wolves is away at Olentangy Berlin. Kilbourne JV lost 8-5 to Mason in a game that was a tale of two halves. Kilbourne JV shut out Mason 3-0 in the first half. Kilbourne added a goal to go up 4-0 in the first possession of the half. Then Mason rattled off 7 straight goals in the 3rd quarter to take the lead and never relinquish it again. The Wolves were short swing players in the second half but Mason outmatched Kilbourne JV to claim the win.